President Donald Trump on Thursday agreed to meet face-to-face with North Korean leader Kim Jong Un in the next two months. But North Korea has pulled out of talks before, and experts say the US should approach with caution, as Pyongyang may using engagement to secure sanctions relief and buy time to cement its nuclear status. President Donald Trump on Thursday agreed to make history as the first sitting US president to meet face-to-face with a North Korean leader – but Kim Jong Un’s unprecedented offer may actually be part of a diplomatic offensive designed to shatter Trump’s progress on pressuring the country to give up its nuclear weapons. The breakthrough happened after what is thought to be a lighthearted dinner between Kim and South Korean officials this week, where, according to South Korea, Kim joked about himself and expressed willingness to dismantle his country’s nuclear program and enter talks with the US. Trump, who as president has led the strictest sanctions yet against the North, started roundly receiving praise after Kim made what appeared as large concessions in seeking talks. “The leadership of President Trump, who gladly accepted Chairman Kim’s invitation, will receive praise not only from people in the South and the North, but also from people around the world,” South Korean President Moon Jae-in said through a representative. But North Korea has pulled out of talks before, and experts have urged Trump to proceed with caution. Good-will diplomacy, or a diplomatic offensive? In agreeing to give up his country’s nuclear weapons, Kim would be flipping on a core principal of his politics. But the US under Trump has said it will talk to North Korea directly only if Kim considers getting rid of his nukes. North Korea discussed that possibility with South Korea this week and, according to South Korean officials, seemed open to it if the ruling government’s security would be guaranteed. The question will be just how to make North Korea feel secure enough to part with its nuclear weapons, which it sees as an existential necessity. For that reason, most experts remain sceptical toward the talks. North Korea’s new policy of engagement with the US “should be understood as a tactic to secure sanctions relief, buy time to cement the status quo of DPRK’s nuclear weapons status, and to try make inter-Korean contact a priority for Seoul over the US-ROK relationship,” Chad O’Carroll and Fyodor Tertitskiy write at NK News, a website for expert commentary on the Korean Peninsula. By agreeing to the simple consideration of denuclearization, Kim has managed to advance North Korea’s diplomatic agenda tremendously without agreeing to concrete action. North Korea could still introduce nonstarters into negotiations, for example agreeing to denuclearize only if the US withdraws all its forces from South Korea. Similarly, agreeing to denuclearize only if the US or the whole rest of the world does the same would seem to meet the conditions for talks while ultimately achieving nothing. What does Kim stand to gain? 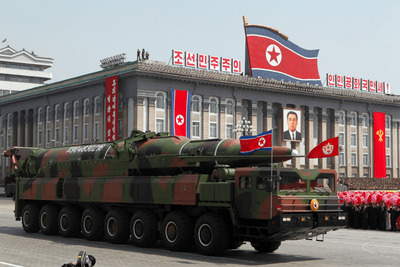 North KoreaA mobile missile launcher at a military parade in Pyongyang, North Korea, in 2012. Under Trump, the US has ramped up pressure on North Korea more than ever before. On a near monthly basis, new US-led sanctions hit North Korean people, banks, ships, companies, and virtually any entity or avenue of commerce. As a result, sanctions are beginning to bite and drain the country’s reserves of cash. “North Korea has a history of having these big sanctions arrayed against it,” Shea Cotton, an expert on the history of North Korea’s missile program at the James Martin Center for Nonproliferation Studies, told Business Insider. But North Korea also has a history of entering talks to gain sanctions relief, only to back out at the last moment. “After the sanctions are off for a while, North Korea returns to its bad behaviour and the US has to build back up sanctions,” Cotton said. With greater international support for and pressure on North Korea, Kim’s diplomatic offensive can give the world the impression that he is ready to negotiate and that Washington, not Pyongyang, is stoking tensions. North Korea’s move toward peace talks could also be intended to highlight differences between US and South Korean policies toward the country, potentially straining the relationship between two of the most important countries involved in confronting Pyongyang’s nuclear threat.